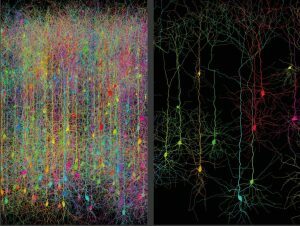 In experiments only a tiny fraction (right) of all neurons can be sampled in parallel (figure generated with TREES). Partial information decomposition (PID) allows to assess fingerprints of neural processing [figure from Wibral, et al., Entropy (2017)]. To analyze long-range correlations in the tempo fluctuations of music performances, the beat of each piece must be extracted with millisecond precision [workflow from Sogorski, Geisel & Priesemann, under review].